Getting an error message similar to the screenshot below? As of April 2019 Microsoft does not support add-ins when used with shared or delegate mailboxes. Since CloudExtend Outlook is a Microsoft add-in you will receive this message when attempting to use CloudExtend from a shared mailbox. Microsoft has advised that they are investigating supporting this for all users. Once they do CloudExtend Outlook will also support it. Meanwhile check out the workarounds below. Please note these workarounds are not supported by Microsoft or CloudExtend and could break at any time. Since Microsoft add-ins work with full access mailboxes the best solution would be to license another full access mailbox from Microsoft and have each user add it to their profile. From this point forward users just need to sign in to CloudExtend with their NetSuite email address (ie business as usual) and they will be able to attach emails from both their own mailbox and the newly added mailbox. Some users using the unsupported method above have reported having to login each time they switch mailboxes. In this case consider using OWA (Outlook in browser) for the above full access mailbox (your old shared mailbox). We have found that Mac desktop users are able to use the app. This is not advertised as being supported by Microsoft so it may go away at any time. 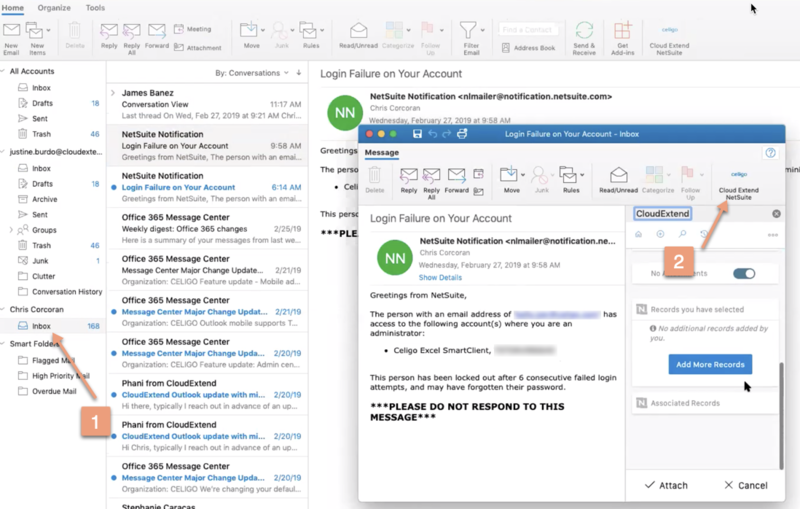 When the delegate or user accessing the shared mailbox is a licensed CloudExtend user they can navigate to the user's mailbox and attach emails to NetSuite records as if they are attaching emails from their own inbox. Learn more about delegating mailboxes from Microsoft's website here.